We are living in a time of the live broadcast TV musical. Take a hit musical theatre show like Hairspray, Grease, Jesus Christ Superstar or The Sound Of Music, recreate it in a TV studio and broadcast it live around the world. 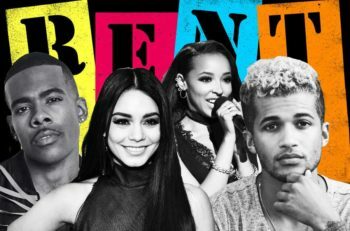 Last Sunday was the turn of Rent Live! Jonathan Larson is one of the most well known musical composers in the world because of Rent. It is the show that made him a household name in every theatre-lovers home. Tragically he died on the morning of the show’s first preview on Broadway, so he never lived to see the legacy he had created. During the dress rehearsal, the day before the live broadcast of Rent Live, Brennin Hunt (Roger) broke his foot. The show announced that the broadcast would go ahead as planned, but footage that had been filmed during the dress rehearsal the previous day would be used instead. Only the last fifteen minutes of the live show was ‘actually’ live because the original Broadway cast members of the show were there for a special finale. The show was still performed live, in front of an audience, as planned, however Brennin Hunt performed in a wheelchair and so the producers decided to broadcast the previously filmed version with all the planned choreography. Back in 2016, Vanessa Hudgens’s (who also played Maureen in Rent Live) father died 24 hours before the live broadcast of Grease Live but she carried on with the show and dedicated her performance to her father. But what would have happened if she decided she couldn’t go ahead with it? What would they have done then? Was there an understudy who could have taken her place? The same question arises here with Rent Live. What would have happened if Brennin Hunt broke his leg half way through the live show instead of the day before? What would they have done then? I guess the point is, if you are going to produce a ‘Live’ television special performance of a musical, that is sold on the fact it is performed live, then it should be. And as we all know, the beauty of live theatre is that you never know what might happen. What do you think? Should they have broadcast the live version with Brennin Hunt performing in a wheelchair? Or were they right to show the pre-recorded dress rehearsal footage (not live) the way they intended it to be seen?